Figure 1 : Index shades mounting. 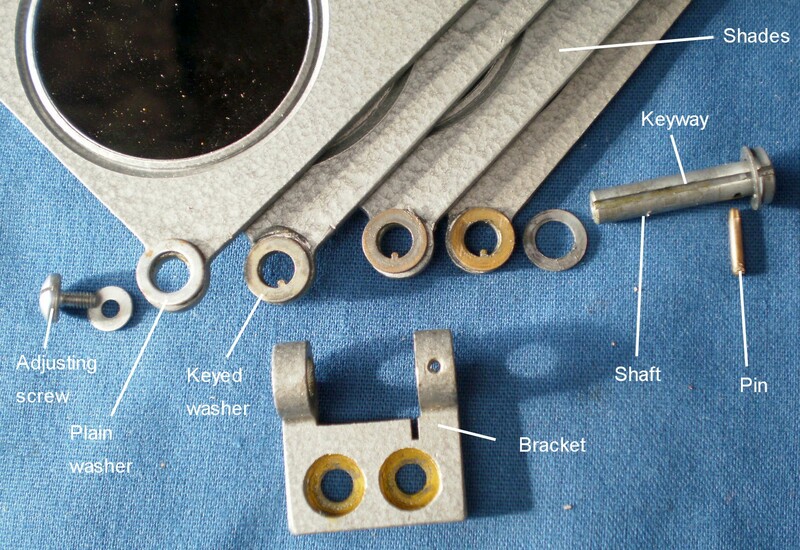 Figure 2 : Step of dis-assembling micrometer mechanism. Now, for a brief account of the SNO-T sextant, please read on. The Navigational Sextant with Illumination, Tropicalised succeeded the SNO-M sextant in about 1976. 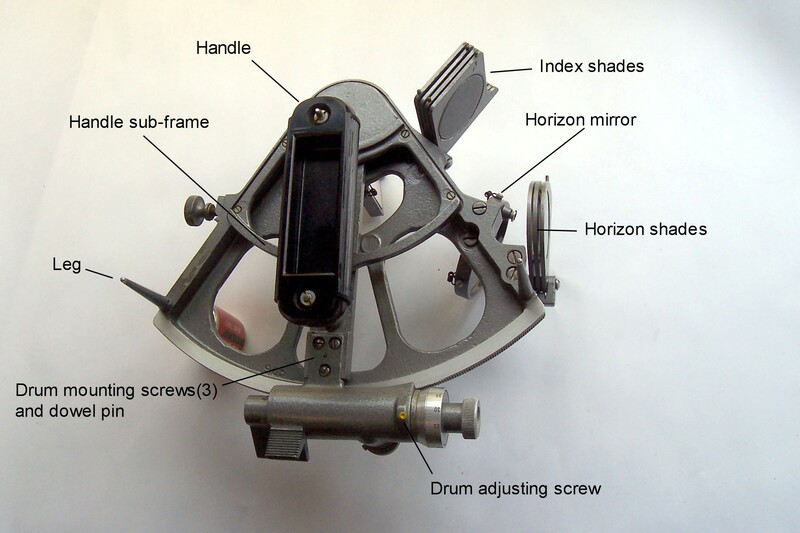 While the SNO-M was a clone of the CPlath WW II sextant, the SNO-T was a modified copy of an early version of the Freiberger Prazisionsmechanik Trommelsextant, with the addition of a self-illuminating magnifier. The radius of the Trommelsextant is about 170 mm, as its worm has a pitch of 1.5 mm, while the SNO-T’s radius is 160 mm, the frame is more strongly braced and the worm is of 1.4 mm pitch. The final point of difference is that the Trommelsextant is a sextant, while the SNO-T is a quintant, reading up to 140 degrees. A Freiberger employee told me the SNO-T was made in Leningrad (now St Petersburg), though the closeness of design makes it highly probable that the conception was German. 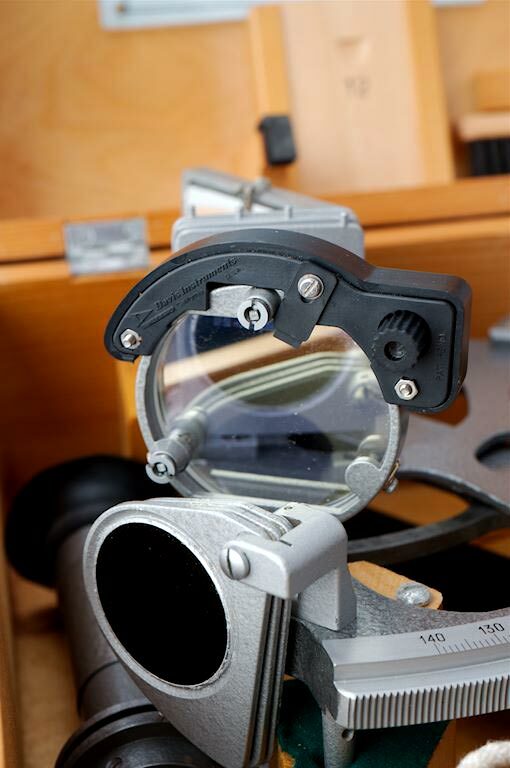 The Freiberger Trommelsextant was developed commercially in the 1950s and by the 80s was selling with a 3.5 X 40 telescope and a modified micrometer release catch position. The shades were also mounted on to the edge of the frame rather than on the face as in the earlier instrument and the SNO-T. The design of the SNO-T departed from the traditional in several respects. The most immediately noticeable is in the micrometer assembly, which is totally enclosed and closely embraces the rack. The release catch rotates the micrometer screw away from the rack by means of an eccentrically mounted bearing assembly and the pressure exerted on the rack by the worm can be adjusted to give silky-smooth rotation. The rack is machined directly into the frame. The very robust index arm lies behind the frame (i.e. on the right hand side) and so the handle has to be mounted on a sub-frame that bridges the index arm. Another radical departure from traditional design is in the form of the index arm bearing, which is a very substantial parallel bronze journal running directly in a hardened seat machined directly in the frame. The frame itself is of aluminium alloy. The edges are very substantial and braced by an elegant web on the face. A photoluminscent micrometer drum magnifier was provided, allowing easy estimation to tenths of a minute. The 1976 specification claimed an instrumental accuracy of +/- 6 seconds with no more than 6 seconds backlash. A later specification modified these to 12 seconds. The sextant was supplied with two telescopes of exceptional quality, probably by Zeiss. The inverting telescope, a 6 X 30, was identical to that supplied with the SNO-M, while the Galilean star ‘scope was a 4 X 40. There was also a kit of extras, comprising a spare (front-surface) index mirror, a cleaning brush, an oil bottle, two screwdrivers, two sighting vanes, a pin wrench to adjust the micrometer drum and a mirror adjusting wrench. The instrument itself weighed 1.5 kg. This very high quality sextant, possibly the best ever made, was let down by being contained in a grey-painted pinewood box and restrained in poorly engineered wooden pockets which were prone to disintegrate in transport. However, when the paint is stripped off and the wood stained and polished the result is very attractive. Currently selling for around US$400, this represents to my mind a substantial undervaluing. Many more details of the construction of this and other sextants may be found in my book, The Nautical Sextant . Robert Lawrence has kindly brought to my attention a sextant sold in 1995 by Sewill of Liverpool, a long-established firm of instrument makers. Although it is named Cetus Primus, it is plainly an SNO-T with some modifications. 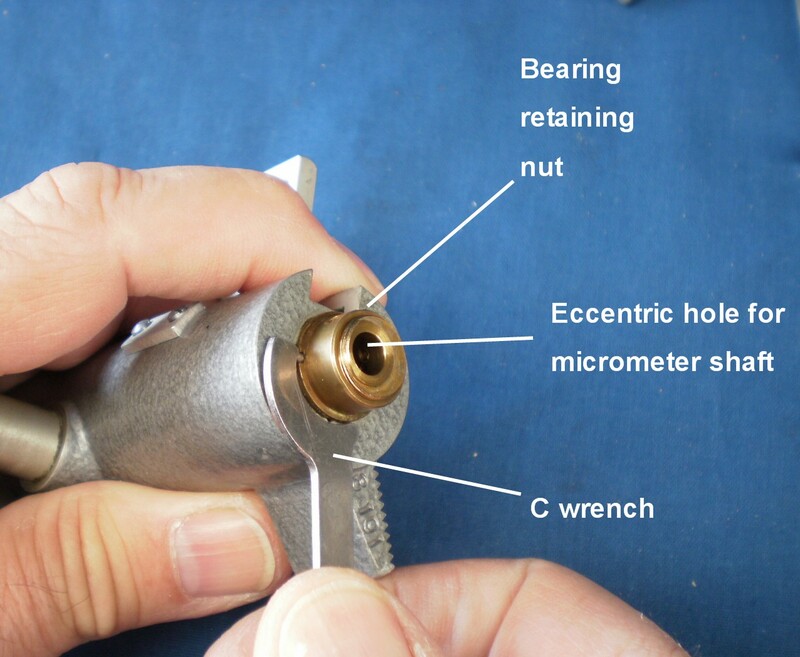 Figure 5 shows a finely-cut vernier for the micrometer that matches the style of the instrument, though anyone with a good quality dividing head could cut his own. While the magnifier could then be dispensed with, it has on its underside some photoluminescent paint that, once charged by exposure to a 40 watt lamp for a few minutes, gives about 40 minutes-worth of scale illumination. Figure 6 shows the horizon mirror of the same instrument. It has the so-called “full view” mirror that allows a full view of the horizon when observing the body. The inventors claimed that it reflects most of the light at the blue-yellow end of the spectrum (stars, sun, moon) and transmits most light at the red-orange end (twilit horizon). An experienced user said that it made easy sights easier and difficult sights harder. Figure 6 : Sewill Cetus Primus “clear-view” mirror with Davis prism attachment. Postscript, October 2013 The horizon shades of every SNO-T I have seen are mounted upside-down. See under “Blunders” category. 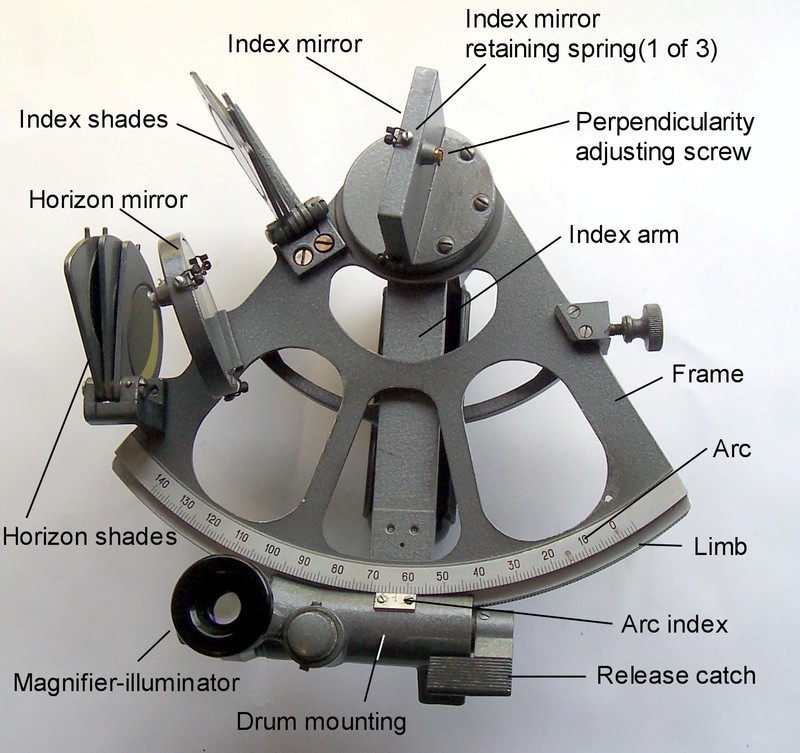 How flat are sextant mirrors? 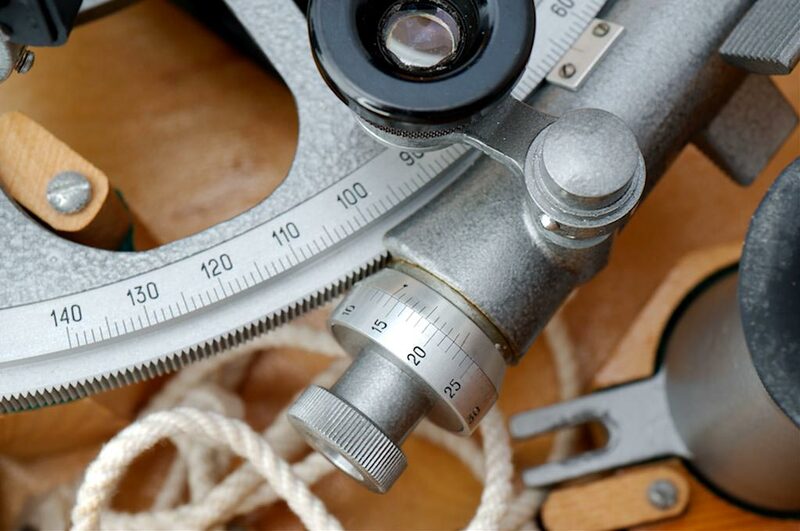 Navigational Miscellany: other navigational instruments and devices.